Requiem, by Karl Jenkins, will be performed by the Chancel Choir and an instrumental ensemble on Sunday, May 7, during the 10:30 worship service. This contemporary work features the choir along with a trio composed of Whitney Glorioso, Kate Peresie and Amanda Woodrow. While much of the music is traditioanl, the composer has incorporated five Japanese haiku "death" poems sung in Japanese. Prominent among the instrumental parts is a virtuosic passage by the harp. The piece also features a large battery of percussion players. Karl Jenkins, trained at Cardiff University and the Royal Academy of Music, London, is one of the most performed and highly-regarded living composers in the world. The performance is sponsored by Ellen Stiffler in loving memory of her mother, Bernice Polhemus. 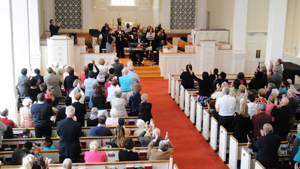 First Congregational Church’s Music & Fine Arts Committee provides the community with a variety of outstanding exhibitions and performances each year. 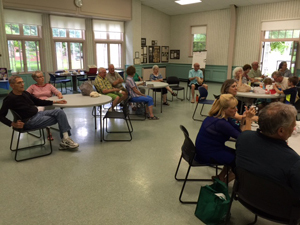 On Sunday, July 19th, FCC hosted a piano recital by Rachel Ballitch. 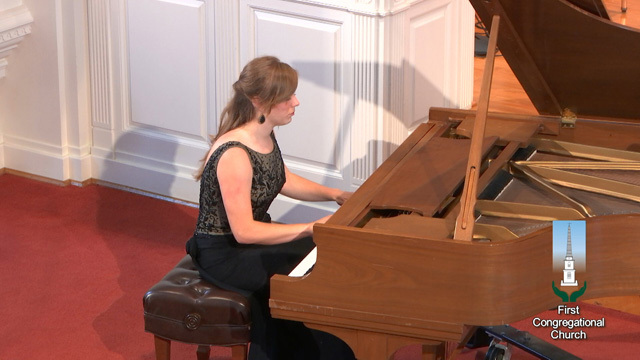 Rachel is a second year piano performance major at Ohio Wesleyan University. She is also a student of Dr. Mahamuti. 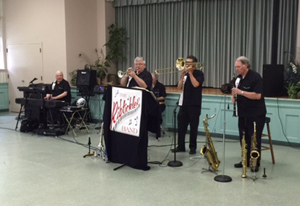 June 18, 2015 FCC hosted "Dixieland on the Lawn". 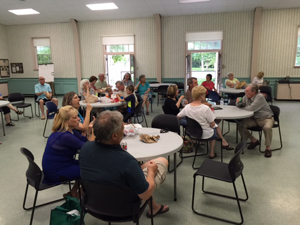 Mother nature drove us indoors where the picnic and show went on in Blymyer Hall featuring the renowend "Ribticklers". It was trully Dixieland at it best. 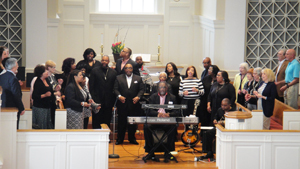 April 12, 2015 FCC hosted "A Gospel Celebration" in the Sanctuary. Nnenna McCruter Jordan, Pastor Walter Jordan, Vera McCruter Polk, Lucas Eilie, Teanna Sykes, Delvas Martin, Patricia McCruter, Briittany Williams, Lisa Brown, Tiffany Williams, Gwendolyn Alexander, The Williams Sisters: Christa, Jucinta & Aryn, Aaron Williams Jr., Garlan McCruter, Latonda Williams, Alice Bond Horton, Sidney Brown, Dr.Larry Rawls and Jamie Hilliard. Participating Churches included: Maddox Memorial COGIC, Oasis of Love COGIC, Mt. Sinia Baptist, Shiloh Baptist and Faith Temple COGIC. 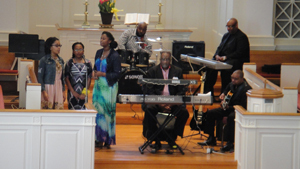 Listen to excerpts of the performance at: Music / Arts > Music Recordings > Rejoice. 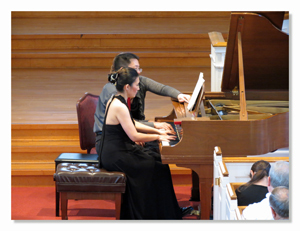 Highlighting the fall 2014 schedule was a wonderfull piano duet featuring returning artist Dr. Gulimina Mahamuti who was joined by Dr. Frank Chiou. 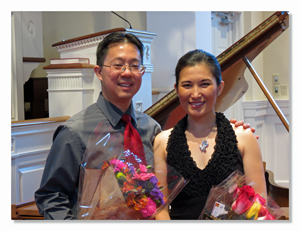 It was a dazzling piano duet performance of Dvorak's Slavonic Dances, Opus 46 & 72. A regular has been our very own FCC member, Sylvia McNair. Occasionally, taking time out from guest performances around the world, teaching at Indiana University, as well as her second singing love, cabaret performances, she joins us in concert. 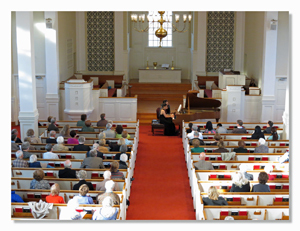 Enjoy Sylvia's performance during the August 16, 2015 10:30AM Service. Go to: WORSHIP / SERVICE RECORDINGS / "Music and Spoken Message 8-16-15"
Several times per year we turn Blymyer Hall into an Art Gallery featuring the works of local and regional artists. Many art forms are displayed, from quilts and ceramics to beautiful paintings and photographs. 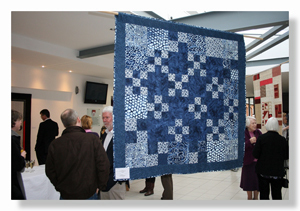 Hundreds marvel at the quality and artistic skills of our congregation and non-members from throughout the community.